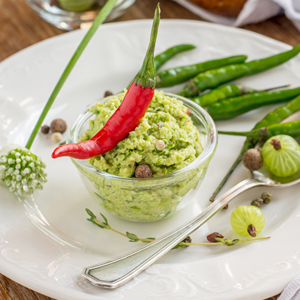 Classic German ingredients naturally make easy finger food for casual entertaining, but they can also combine to make a wide variety of tasty prepared appetizers. From mini-onion tarts to ham-wrapped figs, savory cheese dips to chived potato pancakes, here’s a selection of appetizers to welcome your guests and whet their appetites. 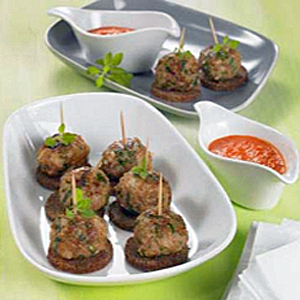 Traditional small meatballs become a festive snack or appetizer when served on Mestemacher rounds with a pepper cream sauce. 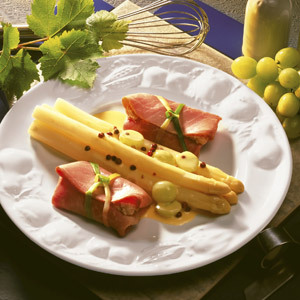 Sophisticated take on pairing asparagus and ham, this recipe pairs ham cream bundles tied with strips of leeks with white asparagus and a warm vinaigrette. A very festive canape of piped bluecheese mousse topped with gooseberry chutney and homemade hazelnut brittle. Recipe courtesy of Chef Uta Schepers. Appetizer of bone marrow on toast with onion confit and blue cheese cream, from Schoon's Bakery in Cape Town, South Africa. Marinated, braised and roasted pork, shreddibly tender, finished with a horseradish sour cream sauce. 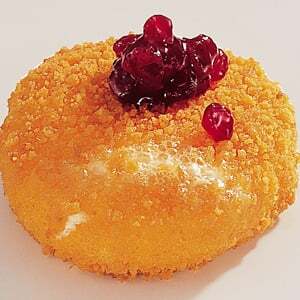 Recipe by Chef Hans Roeckenwagner. 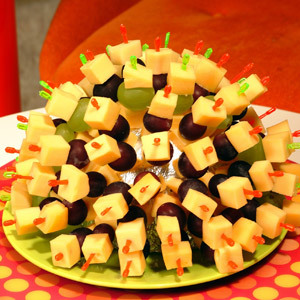 (Käse-Igel) Simple, tasty party appetizer that also looks great. German artisanal cheeses and grapes speared on pics into a melon half. 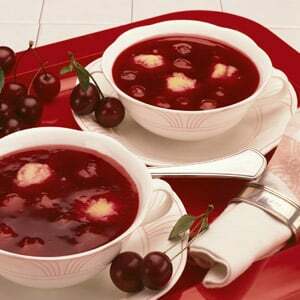 (Kirschsuppe mit Griessklösschen) Wonderful cold fruit soup of dark red sour cherries spiced with vanilla and cinnamon, with cream of wheat dumplings. 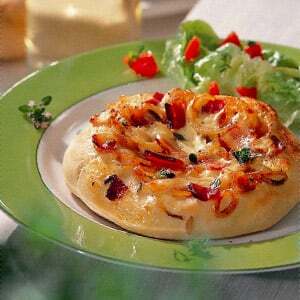 (Pfannkuchen mit Camembert-Schnittlauch-Füllung) Flavorful crepes with German Camembert cheese and chives, served with cranberry relish and a green salad. 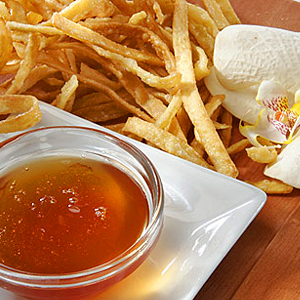 Quince jelly and balsamic vinegar gives this crispy fried pasta a new flavor dimension. 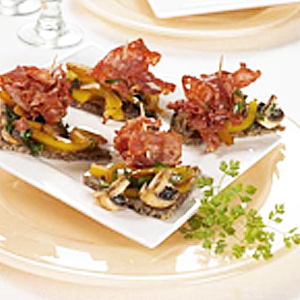 A canape of three clear German flavors on earthy sunflower seed bread - farmers ham, rosehip jam, and silver onion. Recipe courtesy of Chef Uta Schepers. Festive appetizer of wine-poached pears with balls of warm crusted German brie and lingonberry preserves. Breaded Tilsit cheese triangles served on cherry tomato coulis and fresh purslain or basil. 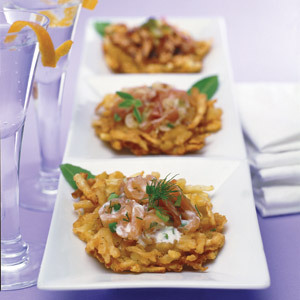 Created for Germanfoods.org by Chef Hans Roeckenwagner. Appetizer of wine-soaked figs wrapped in Black Forest ham, and served over a salad of frisee with hazelnuts and yellow and green beans. (Handkäse mit Musik) Appetizer with the rich honest flavors of German hand cheese (Harzer) marinated with sliced onions, caraway seed and cider vinegar. (Hering mit Frischkäse-Sauce) Herring appetizer of Matjesfilet herrings with blanched apples and onions, sauced with a creamy apple-onion sauce. Oktoberfest or holiday party treat with German flavors. Strudel with apple, sauerkraut and knackwurst or bratwurst, with a sweet mustard cream sauce. (Handkäse mit Musik) German sour milk cheese appetizer, marinated with chopped onions, mustard and cider vinegar. A culinary speciality of Frankfurt. (Hering in Jogurtsauce) Marinated herring in a creamy mayonnaise and vanilla yogurt sauce with German pickles. (Kleine Zwiebelfladen) Onion slices, garlic and Black Forest ham baked in seasoned sour cream on individual sized bread tart bases. 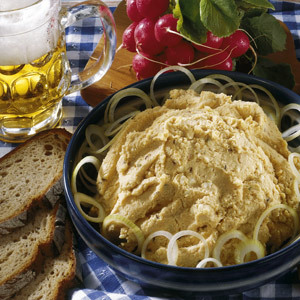 (Obazda) Traditional Bavarian appetizer spread made from camembert cheese, double cream cheese, onions, paprika and beer. Serve with bread or pretzels. (Zwiebelkuchen) A savory tart of browned onions, Black Forest ham, and sour cream. 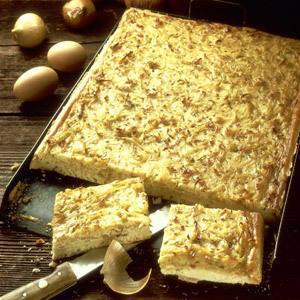 Onion cakes such as this are popular in Germany's winegrowing regions. 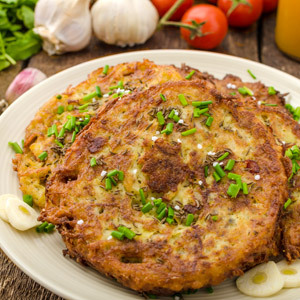 Potato pancakes are quick and easy when you start with a mix. Dress them up with ketchup, grated cheese and chives. 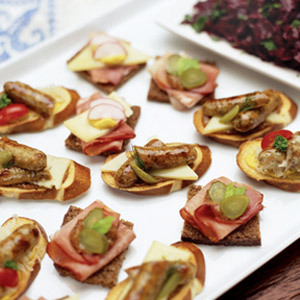 (Butterbrot-Variationen) German party sandwich ideas from Roz Denny German breads, meats and cheese make a party sandwich platter with garnishes. Cream cheese, quark and sour cream combo typical of Rheinhessen and Rheingau. Serve as a spread with fresh bread, pretzels, radishes or Pellkartoffel. Easy adaptation using puff pastry dough. The German name of this favorite party snack literally translates as Little sausage(s) in bathrobe. A tasty appetizer of savory pork with bacon, mushrooms, leeks, juniper berries and cream between layers of crescent roll dough. Potato pancakes for a cocktail party, served with a choice of Black Forest Ham Sauerkraut, Smoky Salmon Creme Fraiche, and BBQ-Curry Chicken toppings. 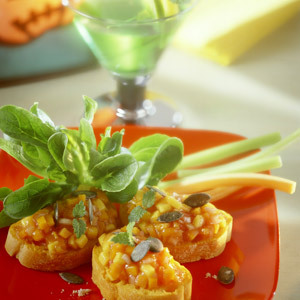 (Crostini mit Kürbisrelish) Fresh pumpkin relish tops crisp crostini in this perfect appetizer for fall and winter entertaining, or a late-day snack. (Schmand-Knoblauch Dip) Sweet and sour plus spicy describes this easy dip of mango chutney, lime, and spicy garlic ketchup in a German quark base. Quinoa, pan fried tofu strips, spinach, carrots, and pickled veggies in nori wraps -- A vegan twist on a food we all love. A quick and easy German twist on crostini, made with German rye bread, soft cheese, tomato, basil and seasonings. Recipe courtesy of Roz Denny. 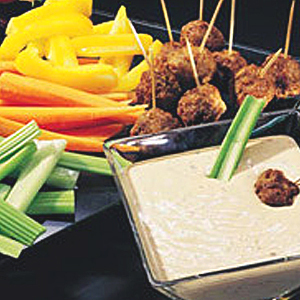 These canapes starts with sauce remoulade, topped by a salami rosette, and a cornichon-parsley garnish. Recipe courtesy of Chef Uta Schepers. 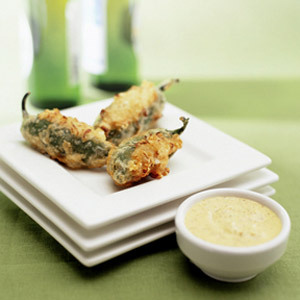 Jalapeno peppers stuffed with German flavors of Bavarian sauerkraut, Pilsner beer, and cheese, and served with a sour cream and Bavarian mustard sauce. 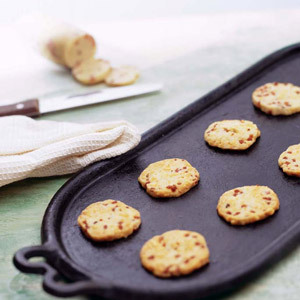 Savory shortbread appetizers with peppery bite flavored with German Black Forest ham, Emmentaler cheese. Dough can freeze for a month before baking. 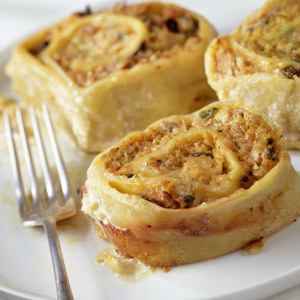 (Schinken-Sauerkrautrollen) Flavorful filled ham rolls, sauerkraut seasoned with leeks, juniper berries and clove. Perfect for Oktoberfest. 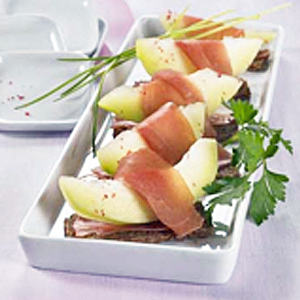 Snack or appetizer of cured Serrano ham and sweet melon on robustly flavorful Mestemacher Whole Grain rye bread. (Büsumer Krabben-Cocktail) A shrimp cocktail in the style of one of Germany's North Sea islands. Canapes of smoked mackerel topped with a apple-horseradish cream, garnished with chervil. Recipe courtesy of Chef Uta Schepers. Grilled ham-wrapped shrimp appetizer served over sesame stir-fried napa cabbage and sauerkraut. 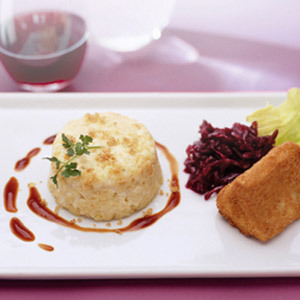 Created for Germanfoods.org by Chef Hans Roeckenwagner. Novel presentation of German flavors of red cabbage, spaeztle, and Cambozola blue cheese, a nutritious and elegant vegetarian entree for a holiday meal. Camembert stuffed with hazelnuts, grapes and pumpernickel with a bit of chili and a bit of honey. Party food that needs no cooking as is quick to assemble. (Sommerlicher Kräuter-Dip) Summer dip using German quark and yogurt with summer herbs like scallions, parsley, dill, mint, coriander, cumin, and lemon. A snack sandwich of rich sun-dried tomato, mushroom and sage flavored cream cheese with endive on slices of Mestemacher Mixed Cereal bread. 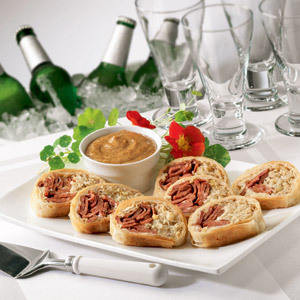 Westphalian ham wraps around a Black Forest ham mousse in this appetizer with a built-in handle. 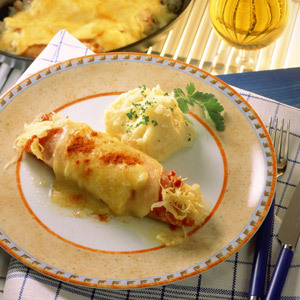 Created for Germanfoods.org by Chef Hans Roeckenwagner. 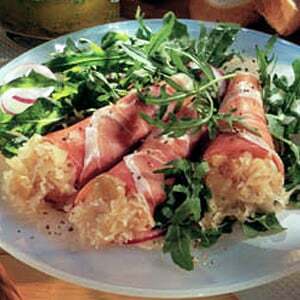 Black forest prosciutto rolls stuffed with mild champagne sauerkraut on a bed of arugula salad – Great appetizer, quick and easy to make.